Have lots of orders and lack time to meet the deadlines? This collection of premium furniture WordPress themes will help you meet the requirements of all your customers and survive the intense life tempo. Indeed, the pre-designed themes may be real time-savers, especially when you don’t want to lose any single order. Don’t refuse your clients as the competition on web design market is tough, use quality WordPress themes to cater to their needs. This collection offers you only top-notch designs, created by experienced pros. They were made with customers in mind, so even if you don’t have extensive technical skills, you’ll manage to create a good-looking, feature-rich, unique website. WordPress is an ideal base both for professional web developers and newbies. The CMS powers thousands of sites all over the world. Millions of people use them on a daily basis and are happy with their choice. WordPress is utterly customizable. You can change each and every design element to make your site differ from the rest of similar sites available on the Internet. But that’s not all. As you buy the theme from the reputed provider, you get even more than you expect. We talk about a number of benefits like 24/7 support, regular updates, quality guarantee, etc. All of the WP themes showcased below are for furniture and interior companies, but if you have a look at their layouts, you’ll see that all of them are different, creative, appealing and up-to-date. Furniture WordPress themes are responsive, retina-ready, cross-browser compatible, which provides an excellent user experience on any gadget. The themes are SEO friendly, which is also cool. They are delivered with comprehensive documentation on installation and customization, although Cherry Framework and Bootstrap make this process utterly quick and simple even for people with no technical skills at all. All manipulations are really intuitive. We guess it’s time for you to view the themes with your own eyes. Click their ‘Detail’ and ‘Demo’ links to view the themes in action and know everything about their features. Jevelin is a lightweight and responsive WordPress premium multipurpose website theme. 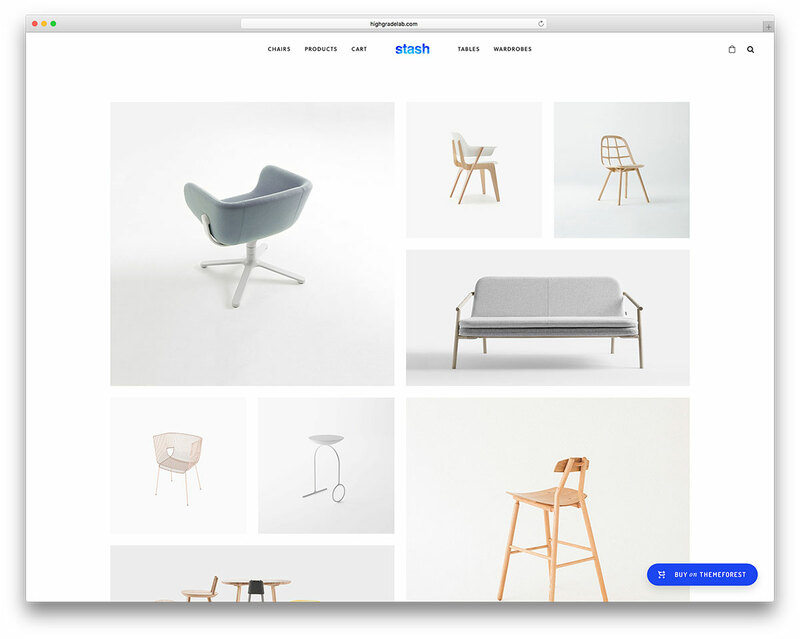 This theme is a resourceful framework for building awesome modern websites for furniture related websites. 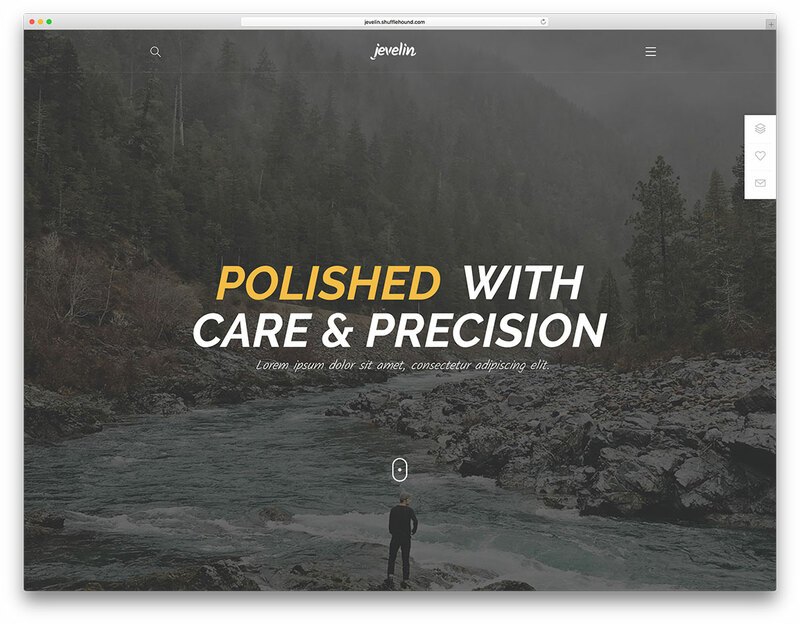 Also, you don’t need any coding experience to get polished results with Jevelin. With sophisticated demo websites for a range of applications, Jevelin wastes no time. In addition, you can pick your template and customize at will with tons of widgets and shortcodes. You can also drag and drop 40 unique elements into your layouts in an instant. Expand what your website can do with powerful portfolios, blogs, stores and more. Users across all industries and applications find creative solutions in Jevelin. Also, creative design agencies love showcasing their portfolios with Jevelin. Corporations and businesses can present their services for potential clients in style. Moreover, seamless animations and transitions make Jevelin websites impeccable and enticing. Furthermore, beautiful Parallax visual effects keep your audience engaged and spruce up your content. Awesome video backgrounds and sliders provide an immersive navigational experience. Additionally, custom pagination styles allow you to introduce your content as you see fit. Guide your audience through your website to suit your content’s nature and tone. Lastly, 6 blog styles and 10 portfolio styles afford you plentiful flexibility. Appeal to a broad audience with utter cross-compatibility. Give Jevelin a go today, and see for yourself! 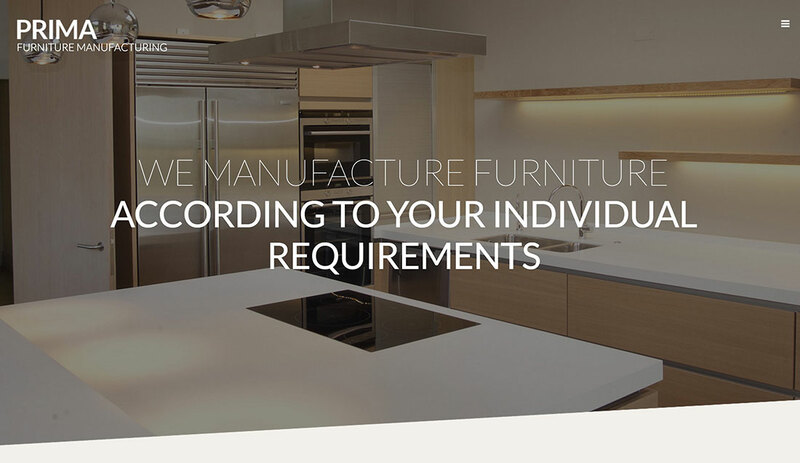 If you are looking to create a furniture-based website, you are in for a treat when it comes to Divi. This multi-purpose WordPress theme is fully equipped with all the right elements and tools to sort out your ideas and plans. 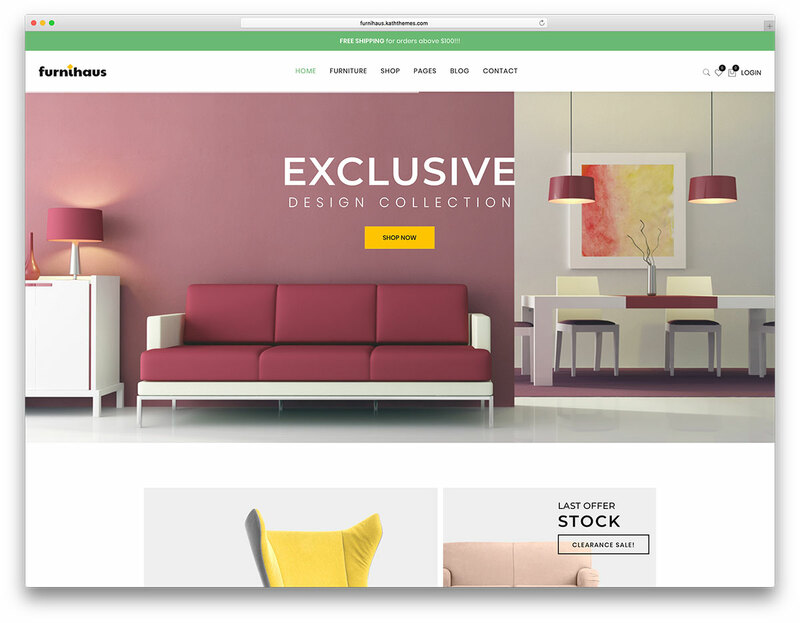 With the fantastic page builder and all the ready-to-use material, Divi has in store for you, you will have your own furniture website up and running in little to no time. 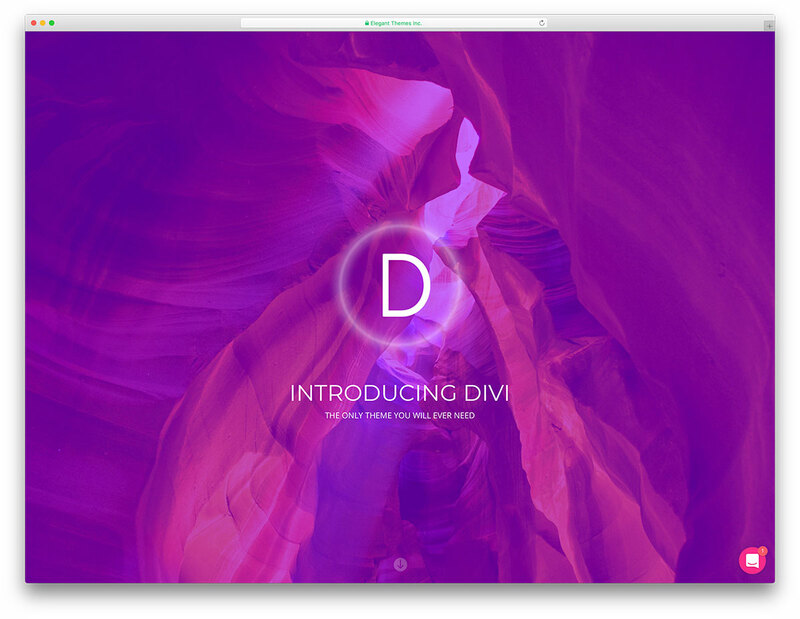 Make sure you utilize Divi to its fullest and see the magic happen. Sooner rather than later, you will have an enticing and attention-grabbing page ready to get your word out there. Besides, Divi also comes with quick and reliable support and numerous other helpful contents that will assist you on your successful website launch. And if you would like to go against the norm, by all means, do what suits you best. 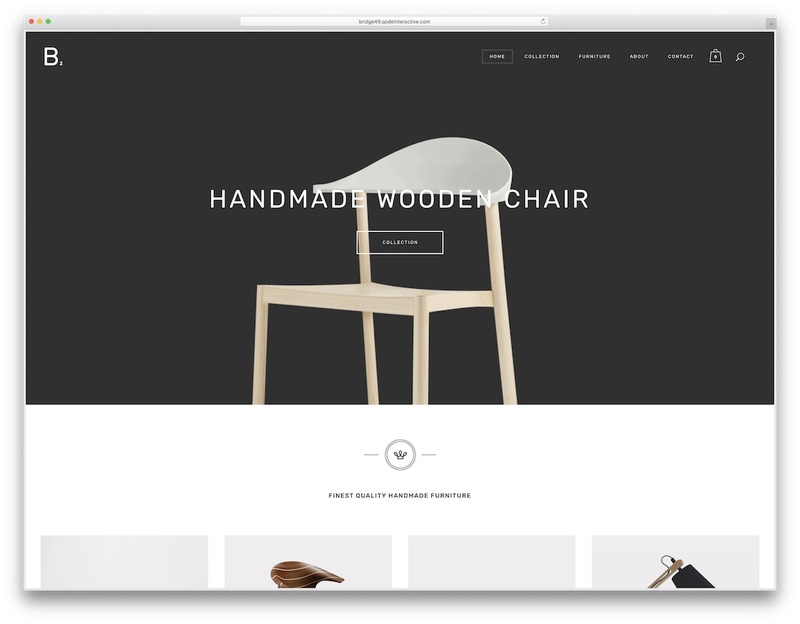 While Vitrine is a fully WooCommerce compatible theme, it is safe to call it a furniture WordPress theme, too. As a matter of fact, once you unbox the kit of amazingness, you will not discover just one but two exclusive furniture demos. Now, you can use these as they are or you can bring things to an entirely new level and enrich the one you fancy more with your individual touch. Vitrine comes with a Visual Composer, Revolution Slider, fantastic pricing table, MailChimp and a broad collection of other handy plugins. 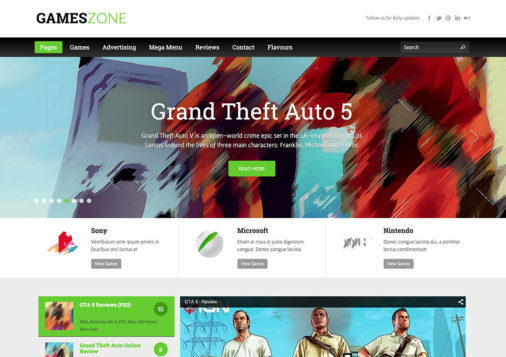 It is fully responsive, retina ready, cross-browser compatible and entirely search engine optimized. For even faster page loading times and better user experience, Vitrine rocks the smart lazy loading. With the one-click demo import, you can have your online furniture store up and running in little to no time. 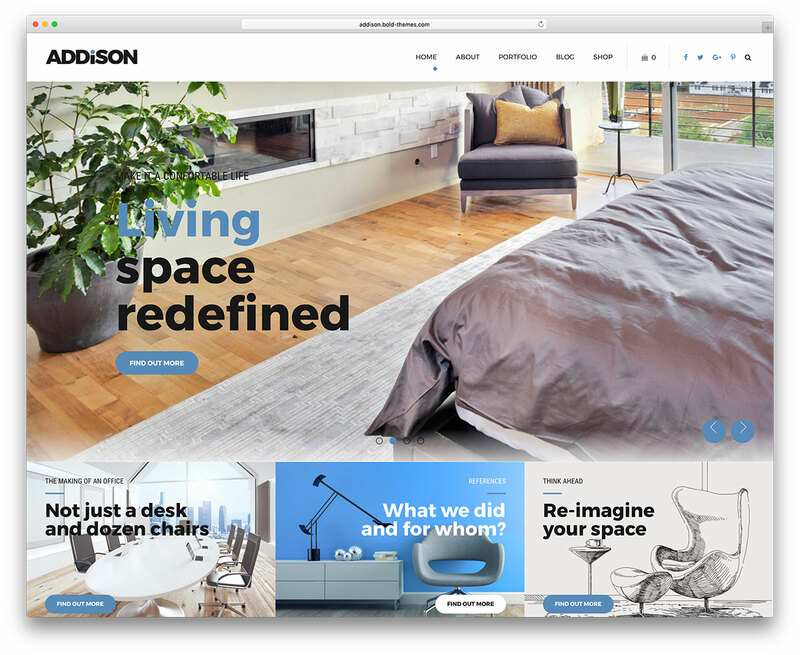 Addison is a clean and modern furniture WordPress theme with five exclusive home page designs and many other internal pages. 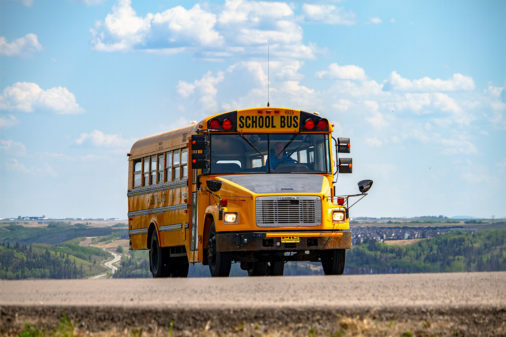 In shorts, with Addison, you can craft a fully functional website for your furniture-related business without the need to look for any 3-rd party extensions and other whatnots. Addison has it all carefully packed in the bundle of goodies that will do you well. In addition, you can freely modify and adjust all Addison’s sample material and incorporate your personal touch to it. The site canvas is also compatible with WooCommerce, comes with cost calculator, different headers, a sticky navigation and full-width and boxed blog and portfolio layouts. Addison also includes in-depth documentation and customer support. Of course, Addison is mobile-ready, compatible with retina screens and in tune with all modern web browsers. KALLYAS is an impressively effective, wonderfully flexible, staunchly reliable and very tech-savvy responsive WordPress multipurpose website theme. Additionally, this theme has been created with the intent of satisfying the needs of a huge array of possible websites and applications across all sorts of industries and fields of interest. KALLYAS is also a potent website building platform articulated around the integrated, in-house developed, plugin-free Visual Builder, featuring well over 100 customizable elements for you to fine-tune to your precise requirements. Moreover, it’s amazingly resourceful, with attractive hardware-powered Parallax visual scrolling effects, gorgeous one-page and multipage presentations for you to choose from, dozens of homepages, online store page templates, portfolio pages, gallery pages, each with a myriad detailed configuration choices you can fiddle with to your heart’s content. Furthermore, with KALLYAS, you make the website you want, every single time. Premium plugins like the Revolution Slider add to the engaging atmosphere of your website, while convenient widgets such as Pricing Tables, Custom Sliders in the broadest variety, stunning “above the fold” Hero Scenes to light up your pages and liven up your content instantly, MailChimp subscription newsletter integration to readily contact your audience or customer base, and much more under the hood round off this solid theme. For your furniture projects, Bridge comes with three super exclusive, contemporary and impressive demos. Each of the samples is unique in its own way, making Bridge one of the finest furniture WordPress themes currently available on the market. Along with the ready-to-use material, Bridge also does not shy away from any challenges. That said, if you would like to go exceptionally artistic with it, you can do that without hassle using Bridge. Some of the very many features and traits of Bridge are parallax effect, testimonials slider, animated skillbars, back to top button and social media icons. Bear in mind, this is just a small fracture of the entire bundle of goods and qualities you can get your hands on after you decide to go with Bridge. 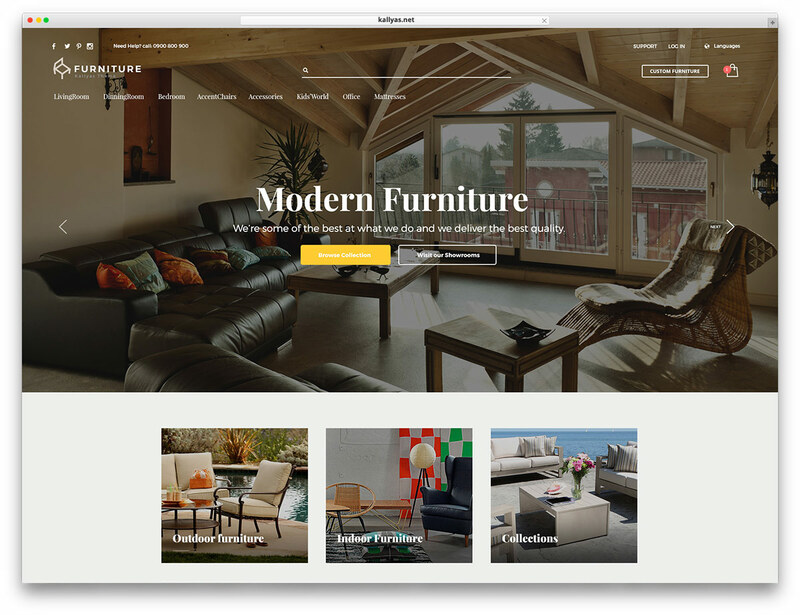 Make your furniture website one-of-a-kind with Bridge and stand the test of time. 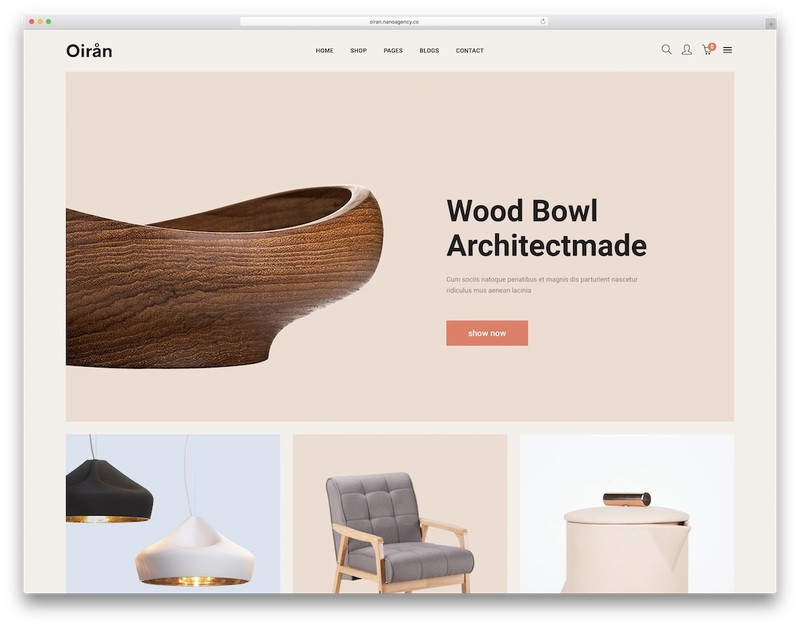 If you are looking for a furniture WordPress theme with numerous valuable features and assets, look no further than Furnihaus. It is a killer tool that quickly sets you up with an online store selling furniture and all that comes along. After all, Furnihaus is WooCommerce ready what makes it that more convenient. But there are loads more goodies in the kit that you can take to your advantage and craft something remarkable that will encourage everyone to purchase. Out of the box, Furnihaus comes with two main demos and various shop, blog and other inner page layouts. In short, you will find it all to experience the fastest eCommerce website launch ever. While you can go with the demo content as is, you can also freely improve it and make it follow your branding to the T. If that is the case, WPBakery Page Builder is something that you will absolutely adore using. By the way, there is no coding knowledge required to edit and adjust Furnihaus to your needs. 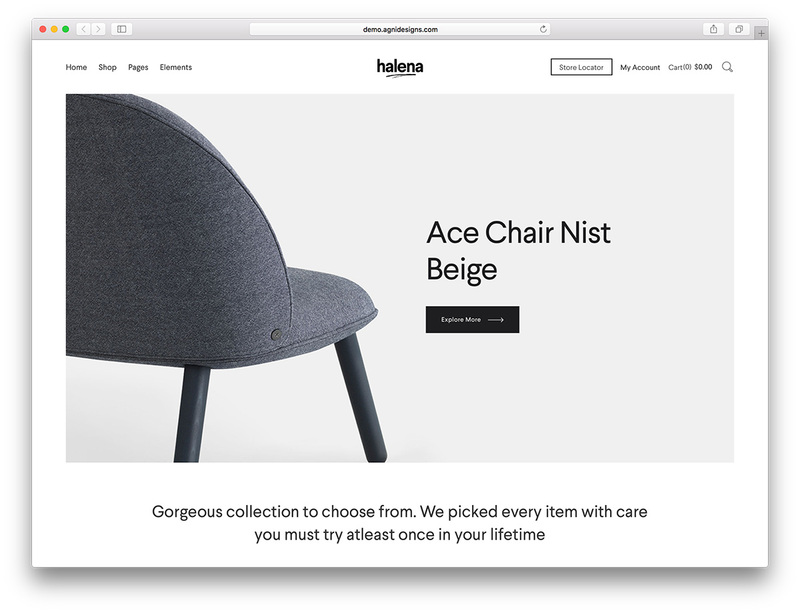 Halena is a clean and minimal responsive WordPress multipurpose eCommerce website theme. This theme is a fast and simple platform for quick creation of functional modern stores. Setting up shop is easy with Halena, no matter what your market or niche may be. Four polished demo websites also provide you with a gorgeous way to get things started. Additionally, plentiful templates for your shop let your catalogue impress visitors in stylish presentation. Unique pin shortcodes let users save items live for later perusing. 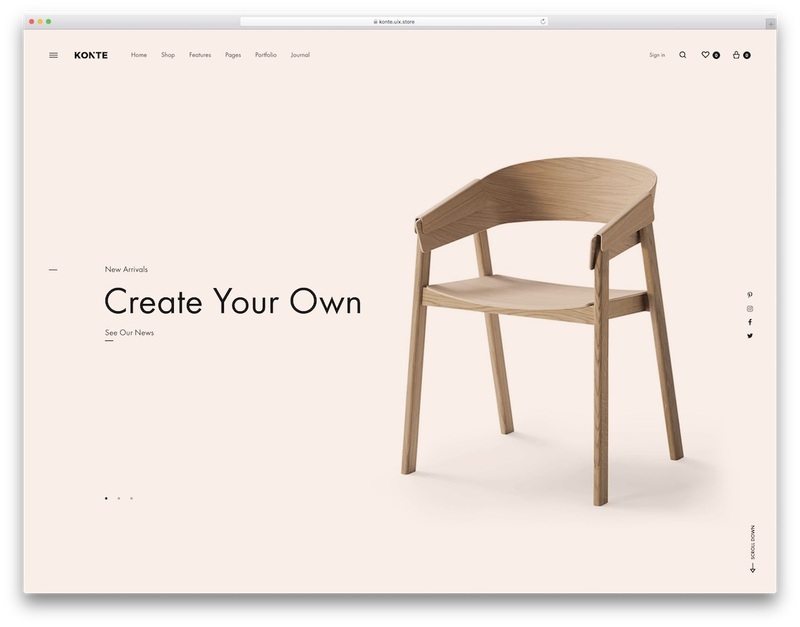 Moreover, Halena’s furniture demo is a minimal and pristine framework to showcase your products. Furniture stores, designers and manufacturers love working with Halena. Furthermore, an intuitive visual page builder makes short work of most design tasks. Craft your website in a matter of minutes without writing a line of code. Deploy portfolios and product showcases without breaking a sweat. Get Halena today! Stash is a beautiful website-building tool made for ingenious markets to rise. It comes with 48 unique and specialized demos (like a furniture shop)! This a HighGrade idea that definitely benefits both creative and busy/lazy. Page building also is done through Visual Composer, and its framework is based on Bootstrap. Similarly, Stash offers advanced typography, multiple headers and customizable backgrounds. Additionally, it has Slide Revolution integration that allows you to build stunning photo albums and slides. Of course, Stash suits just about any business, including such as furniture and movables. Moreover, it has an aesthetic orientation that makes it appealing and great for businesses and PR. It is particularly good for those that need product/service display. Furthermore, Stash can make one page and multi-pages at the same time. Of course, you can show off your staff, products and testimonies of happy customers if you want. Customer trust can be built on communication through Minimal Forms. Lastly, all texts are translatable with WPML compatibility! Do you think that’s all? We are barely starting here! Additionally, you can find tons of documentation to get by easily. Customer support is also provided. Get your furniture business going, no matter the season or current location! Get Stash! 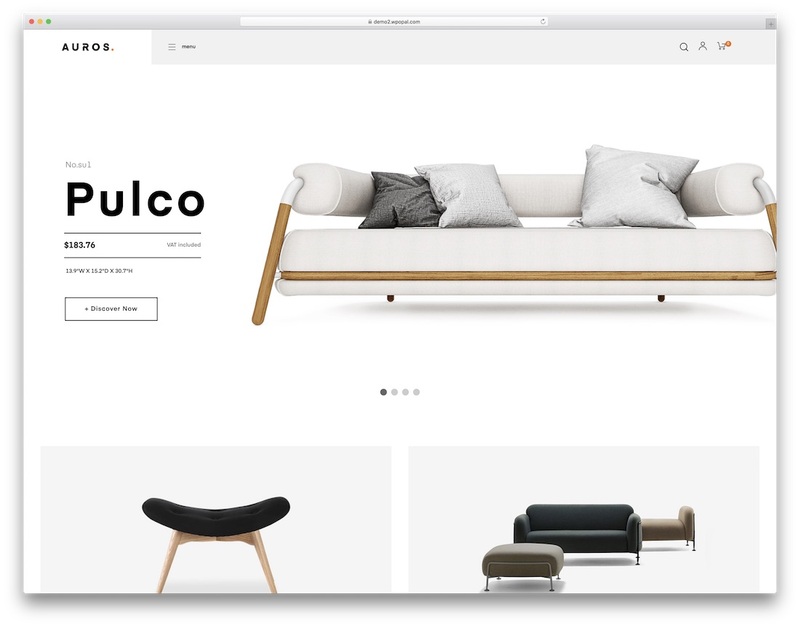 Auros is a dedicated furniture WordPress theme powered by Elementor drag and drop page builder and WooCommerce plugin. Indeed, you can start selling all sorts of stuff almost instantly. Seriously, if you have the content ready, you will be done building your new eCommerce website in a small breeze. And, of course, you do not need to be a coder to make things happen. Even when it comes to adjusting and improving the default demo content, it’s the Elementor website editor that does the trick. In the bundle, you will discover a fantastic collection of nineteen home page layouts that will get you going in no time. Moreover, Auros is also 100% mobile-ready, responsive, cross-browser compatible and retina screen-friendly. It also comes with several shop and blog page styles, so you really do not need to build anything from scratch. If the minimalist look is your cup of tea, Konte is the WordPress theme that you will enjoy using. This multi-purpose site canvas quickly acclimatizes to an assortment of different purposes. In other words, yes, you can employ Konte as a furniture WordPress theme, too. There are ten mesmerizing demos to choose from, seven product and ten shop pages, as well as twelve headers. Every ready-made demo is also entirely customizable so you can tailor it to your banding needs precisely. Additionally, Konte contains WPBakery page builder, Slider Revolution, WooCommerce, unlimited colors, built-in products filter and live search with suggestions to name a few. There is all you need and then some to complete creating your online furniture store swiftly. Konte also follows all the latest trends and regulations to secure you with a future proof online presence. 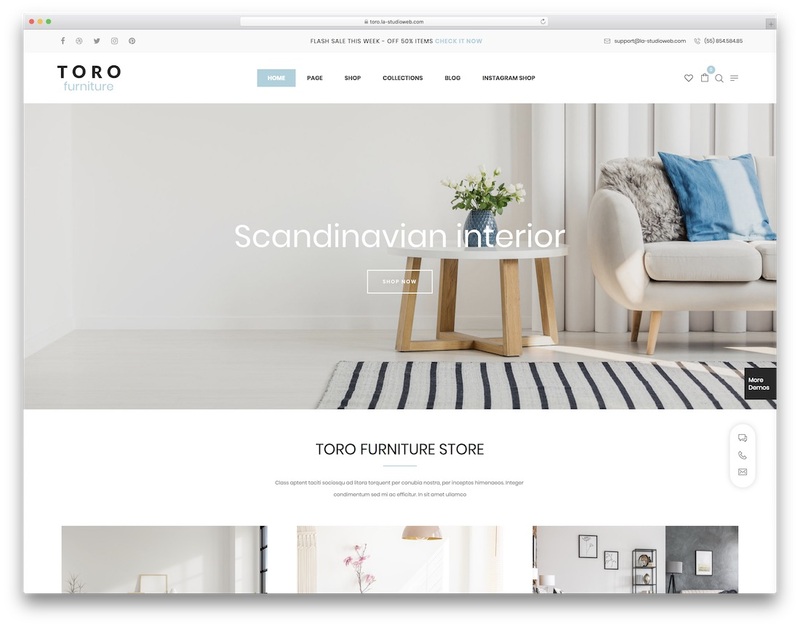 Thanks to its clean, elegant and sophisticated web design, Toro easily adapts to various different businesses and projects. No doubt, if you are launching a furniture website, you can get things moving forward with the cracking Toro. To quick-start your thing, nineteen home and 51 supplementary page layouts will do the trick. Mix and match the available with your material and you will come up with the winning solution quickly. With WPBakery page builder, you can perform tweaks and improvements without any prior experience. There is a lot of uniqueness and originality going on when you start browsing Toro’s live preview page. Also, feel free to create custom headers and layouts, too, without the need to touch a single string of code. 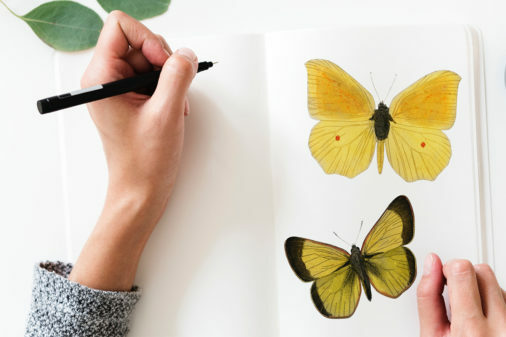 With a simple click on your mouse or trackpad, you can import the desired demo content and start enhancing it with your creative touch and items you would like to push. Take things into your hands with Ginza. This furniture WordPress theme gets your online business up and running sooner rather than later. Get your start by choosing one from three predefined demos. For your information, you can expect new index page variations to drop with feature theme updates. Speaking of updates, those are free and last you a lifetime. 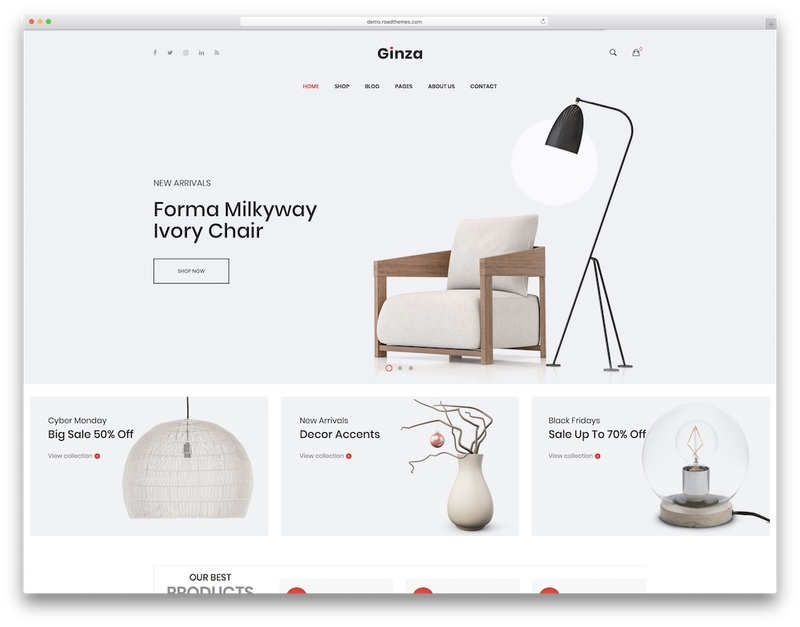 Ginza also gives you access to different headers, mega menu, blog module, product quick view, client testimonials and Ajax add to cart to name a few. It is also compatible with all mobile devices, web browsers, retina screens, plugins and search engines. Ginza is optimized for spectacular performance to ensure smoothing online shopping transactions. Lastly, Ginza puts all your furniture items on display in an elegant and distraction-free way, boosting your potential through the roof. Out of the box, Sheon is a multi-purpose WordPress theme with a wonderful collection of sixteen demos. 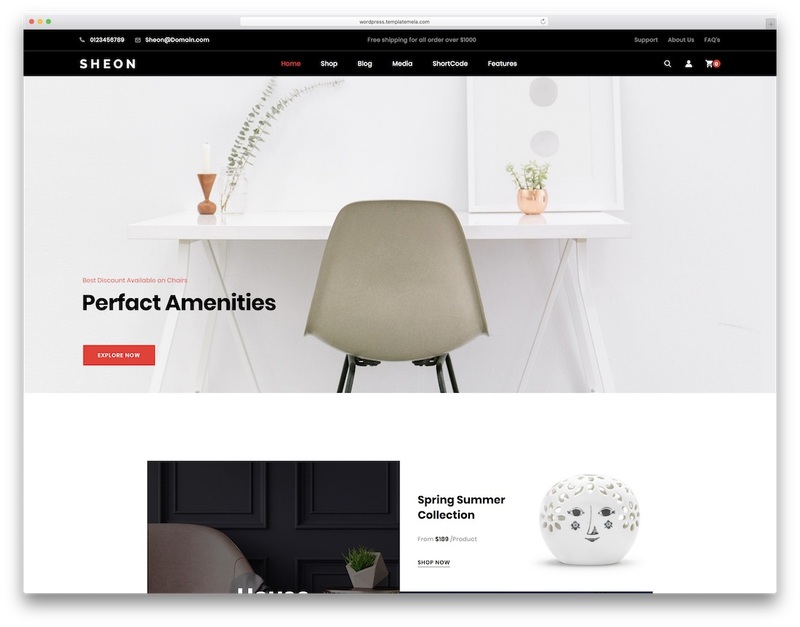 Due to its multi-purposefulness, of course, you can use Sheon for all sorts of different online stores including furniture. While you can use the demo as is, you can also unleash your creative spirit and modify it accordingly. With the drag and drop technology, anyone can craft jaw-dropping pages even if without any prior experience. Sheon sure is super newbie-friendly. Some of the core features of Sheon are Slider Revolution, Contact Form 7 support, PSD files, outstanding support, portfolio layouts, as well as browsers and devices compatibility. Drop-down shopping cart, product grid or list function, newsletter subscription widget, infinite product load and a collection of shortcodes are some of the extra goodies that you can take to your advantage. 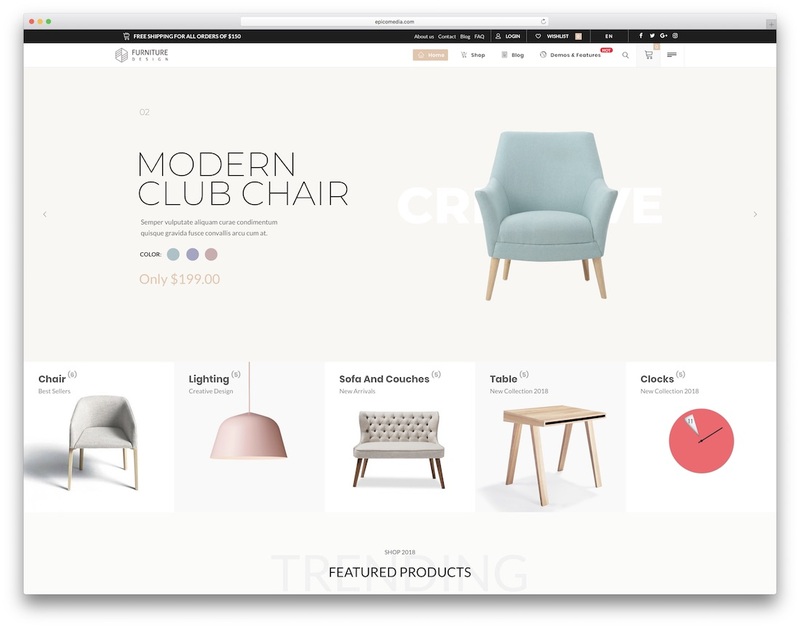 For an eCommerce furniture WordPress theme, Helendo is a mind-bending web design that sparks everyone’s curiosity. Kick things off in style and fashion by selecting one of the twelve pre-built home demos. Each is unique, creative and professional in its own way, ensuring you enough variations to find the one solution that resonates with you best. From then on, you can employ Helendo exactly as is or step it up and adjust the layout until it matches your branding. Helendo covers WooCommerce, WPBakery page editor, headers, off-canvas menu, twelve shop page layouts and countdown timer to leverage urgency and scarcity. 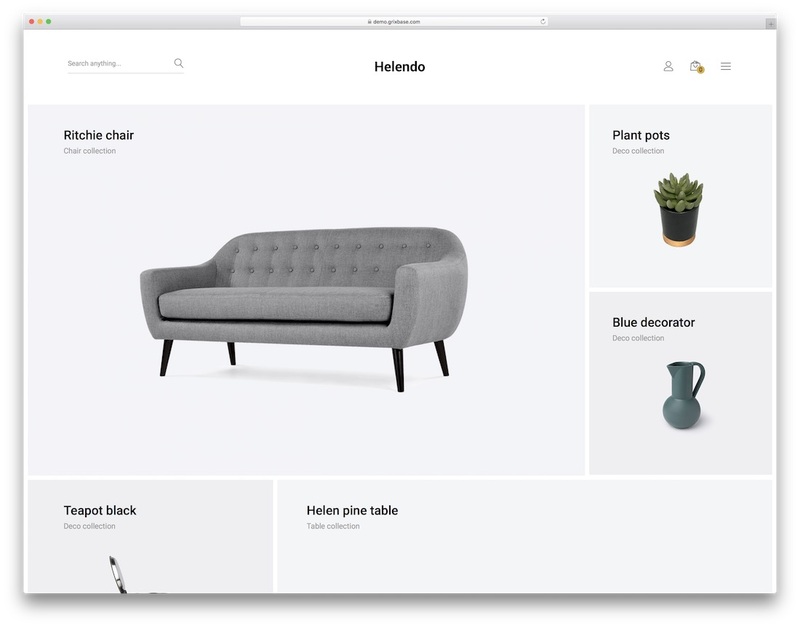 With Helendo’s easy to use interface, you will have your entire furniture website under full control. Manage and maintain it like a pro from the start and grow it to extreme heights. So, you plan to sell furniture, decor, interior design products and other whatnot? If that is the case – which we all know it is – Oiran is the furniture WordPress theme that you should take into consideration. It might be a super fresh tool, but the beautiful web design it brings to the table is not to be missed. Oiran even has six samples which give you more than enough options to find the perfect look for your business. All are clean, nifty and curiosity sparking. Besides, Oiran also practices all the latest trends to make sure your eCommerce page is responsive, in tune with web browsers, retina screens and SEO-ready. You can even start a blog and use it for content marketing purposes, as well as to announce new product drops and other hot news. I have been purchasing furniture templates from Template Monster for several years. A few days ago, setting up the Interior Furniture Theme that I used for my client for his interior design business took me only a few hours. He was extremely satisfied with its modern and clean look, easy navigation and unobtrusive menu. Works exactly as described, I had no issues with it at all. Thank you for your feedback about Template Monster and their themes! I think that many other users will find your feedback useful as well. great list, and thanks for updating it this month, nothing stands still for long, especially in website design. Now to make a short list! Thank you for reporting it! We have since fixed it. Wow ! Excellent Themes. Definitely these will help the companies to reach the customer requirements.